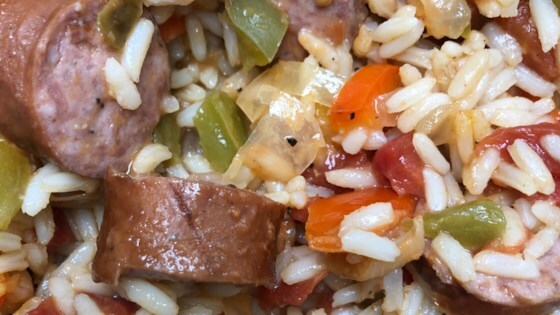 "Spicy jambalaya with chicken and andouille sausage." Excellent! All I had on hand was Italian sausage and it was wonderful. I did need to add another can of tomatoes as there wasn't enough liquid for the rice to cook. Family loved it! Easy to make and Yuuummmmy. I use to own a Cajun restaurant and this is as good as anything we use to make, but a lot easier.